They’re Here ! They’re Here ! 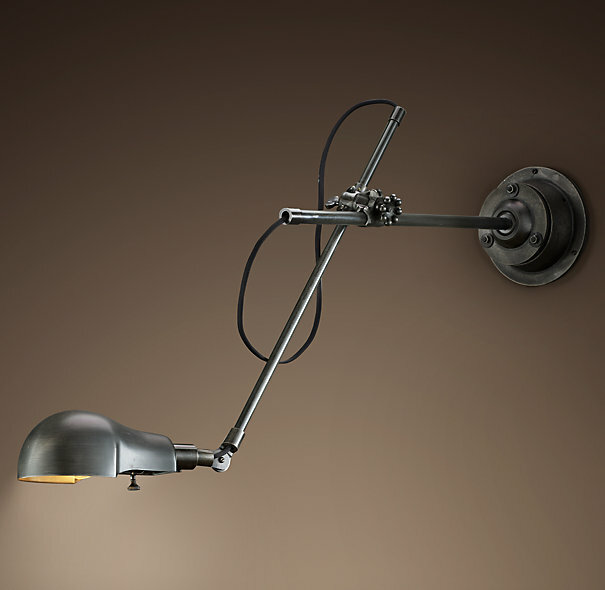 About a week ago I ordered 2 of these from The Restoration Hardware…. Now everyone knows that I am NOT an impulse shopper. FAAAAAAAARRRRRRRRRRRR from it. In fact, there have been several times that I have had to think about a purchase for so long that whatever the Hell I was planning on buying in the first place is long sold out by the time I decide to just buy it . Especially if that particular item is on sale….. But not this time…I have been watching these lamps for years …. The Restoration Hardware is certainly one of my favorite stores…..but the Good Lord knows I can only shop there during extreme sales. I was a tad bit hesitant because they are NON-refundable. But no worries at all…I Love, Love, Love them ……..They are even more chunky and industrial looking in person. Simple, either side of the bed in the master bedroom…but it gets WWWAAAYYY better than that ..
I’m also doing a reclaimed wood wall behind the headboard…. This is something I have been wanting to do for years. And now I have the vision. Here’s the wall I found on Pinterest that totally inspires me ….. Pretty Groovy? Right ? That headboard is pretty close to our bed. Same color and height …..
Look closely…Can you tell where this wood came from? Can you?….Need a hint? That whole wall is made from reclaimed shipping pallets. Shipping Pallets! They’ve just had all the nails pulled and a light sanding. That’s it! Can you belive this? Now I am all about turning trash into treasure…I have been dumpster diving since I was a toddler and I see these things just laying in alleys all the time. Have you ever bought one?…they are only about 3 bucks each. Since I’m not doing the entire wall, just a strip up the back of the headboard and enough on either side of the bed for a rockin’ly cool pharmacy sconce… I shouldn’t need that much wood at all. We have a 3 day holiday weekend this weekend, and because I have been a good boy and completely taken down, packed, and labeled every piece of holiday decor in the house (anyone who knows me …knows that this usually happens around March 15th) ……. I should have plenty of time to do this little project. Wow,can’t wait till you finish the project!